A roman painter of the first Century A. D.
WHO’S THIS AND WHAT’S HE DOING THERE?? I am Jan Hochbruck. My impression is that of a Roman painter. There are quite a few words to describe what I'm doing – Reenactment, Living History, even Experimental Archaeology – whatever. I am enthusiastic about Roman arts and colours and I love to study them and doing research on that topic. YOU MEAN, WALLPAINTINGS AND THE LIKE? I paint on walls, too, but "al secco" – I simply don't have the time and means to learn the complex plaster techniques of al fresco painting. 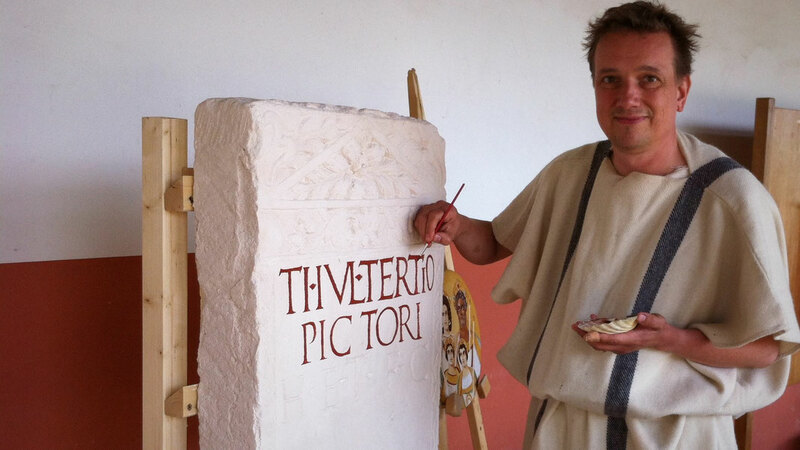 I'm busy with painting on wooden boards – which, itself, was wide-spread and often-used in antiquity. To be precise, I'm working with Tempera and Encaustic. The APPEAR Project brought some amazing new insights into these techniques, due to which there'll be changes to my presentation within this year. Until the insights are published and the findings experimentally re-created, all this here stays the same, in a "cat state" of sorts. CAN YOU MAKE A LIVING WITH THAT? Sadly, no. But I do it nonetheless, in my spare time. This is why my research may not look as swell as by academic standards, but I do my best not to tell any nonsense, and I'm happy about anyone refuting my findings. By the way, I would be happy if somebody else would start painting, too. I'd love to have colleagues.